Wow! 10 months has seen a lot happening in the Farm Jeep garage! Sometimes, months slip by without an update, because there isn’t much going on. But the last months have been filled with lots of activity in the Farm Jeep garage. We’ve spent time researching and bringing our Newgren lift up to specifications. 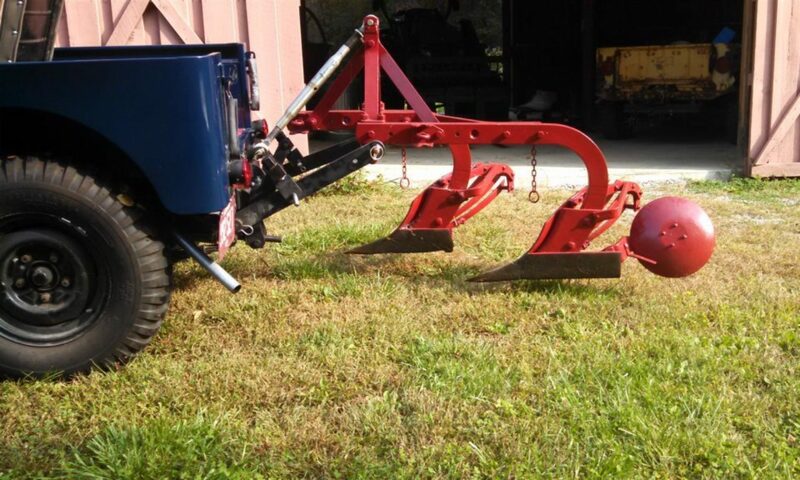 In doing so, we discovered we really do need a Newgren plow to make it work correctly. Added to that battle has been the continuation of leaking pumps. The rebuild vs. buying new discussion continues. Over the summer, Ole Blue developed some engine issues. As long as most of our driving was on/off the trailer while going to antique tractor shows, it hasn’t been an issue. But we want to do more and the time was right to get Blue running around the country roads. Readers also might remember that we had purchased an engine on a stand, to use as a replacement engine. Coupled with the clutch noise, we decided the time had come to do an engine swap. Along the way, Barry developed a nifty tool for removing a flywheel and we also discovered that there isn’t much information out there on engine installs. One of the reasons for developing Farm Jeep was to have a place to collect information and as a resource for us as we discover the joys and frustrations of collecting old jeeps. Over the next few weeks, we will be updating the Web pages with our latest achievements and lessons learned. Previous PostPrevious Every decade or so..